When I heard that Mary Ann Rivers had a series of full-length novels about an Ohio family coming out this year, I was pretty thrilled. I quite liked both of her novellas, one of which--The Story Guy--I recommended here on Clear Eyes, Full Shelves. 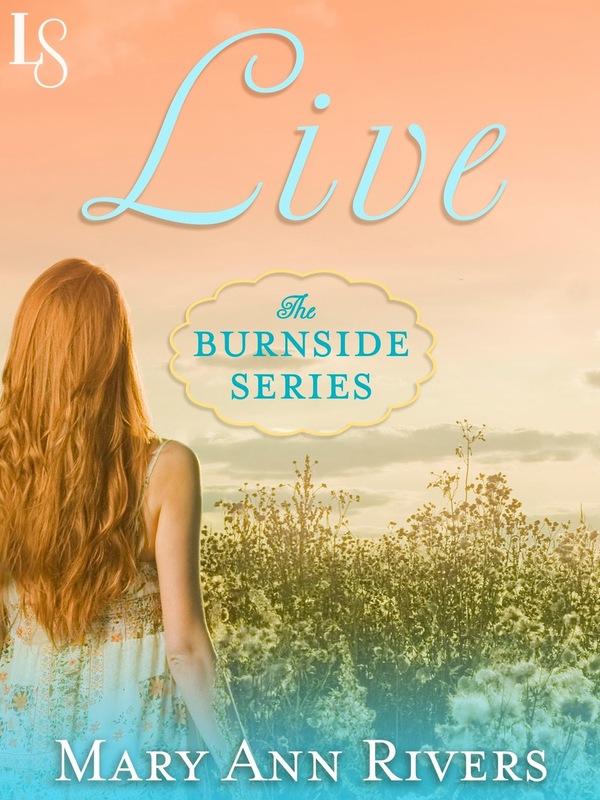 Live is the first in Rivers' series featuring the the Burnside siblings of Lakefield, Ohio (which seems quite a bit like a fictionalized version of Columbus, Ohio). The family is deeply-entrenched in their working class city neighborhood. Each of the siblings live in the area where they grew up and one is starting a medical clinic in their neighborhood. The Burnsides' parents have passed away, leaving them physically close to each other, but adrift at the same time. This first installment in the series focuses on one of the two Burnside sisters, Destiny (Des), who's never left Lakefield. At 27, she finds herself unemployed and spending her days at the public library searching for job openings and filling out applications online. After six months of job-seeking frustration, she finally loses it in the library after receiving yet another rejection. The library Des uses each day has been undergoing a restoration of a massive relief carving. Hefin, 37 and from Wales, is the woodcarver who's spent months restoring and recreating the wood panels. When he sees Des sobbing in her library carrel, he can't help but reach out to her, despite that he's steeled himself against making connections with other people due to his guilt over his divorce from the American wife he followed to Lakefield. Thus begins an intense relationship that might be exactly what they both need, in a number of ways. The fact that it has an expiration date due to Hefin's plans to return home to Wales and then pursue his career in engineering--which derailed due to his marriage and immigration to the United States--isn't a problem since there's so much happening in Des' life (an ill family member, the aforementioned unemployment) and Hefin isn't in a place where he can move on from his mental self-flagellation. What resonated clearly with me in Mary Ann's previous work were the strong voice and point-of-view. Part of that I attributed to that the two novellas were written in first person, which is unpopular in this genre, but is one I love when executed well. Live, on the other hand, is written in the third-person, and I worried that it would limit the author's sharp character development. However, the character point-of-view is actually quite close, far closer than is usually found in third-person. As a result, the reading experience feels more immediate and intense than usual in third-person narrative (especially in the romance genre). It's interesting to me that with Live, the author tackles the common romance trope of one partner following another in pursuit of their career. In this case, Hefin is the trailing spouse who gave up his professional aspirations to be with the wife he met as a result of a whirlwind romance. Over time, he becomes increasingly resentful, feeling like his life is on hold. In a sense, Live is asking the question of what happens after the ending of many romance novels. (Whoa, meta...) Hefin has the first-hand knowledge of what can happen when those stories go wrong and he doesn't want to repeat that with Des as the collateral damage. In that sense Live is a very grownup romance. Live also eschews the artificial, overly-dramatic conflicts that are so popular at the moment for authentic, realistic problems. Des' unemployment and worries for her sister's health, Hefin's career disappointments and longing for the parents he left in Wales--these are real issues that don't have simple fixes. I appreciated that while the core of the story is, obviously, Hefin and Des' romance and how they figure out a way to have a life together, that their stories as individuals were never diminished. Each had to also find their own path as well. In this way, Live read to me as a very feminist novel. As I've mentioned a time or a thousand, I'm generally reluctant to label books as feminist or not because it's very relative and dependent on what each reader brings to a text. But, when I think of a feminist narrative, I see feminism when a story allows a woman to discover and live her personal truth. Des figuring what she wants, and giving herself permission to want things for herself, is a rewarding payoff, one that I'd like to see more of in this genre. But I also appreciated that Hefin, too, had personal agency. I've been critical of books with narratives which disempower one half of a couple in service of the other half's empowerment, and Live is a fabulous example of that balance being struck in an honest, unidealized way. I'd be remiss in discussing Live without acknowledging the unique quality of the writing itself. Rivers' style is highly descriptive, and it's one that readers will either love or run away from. I adored the rhythmic, flowing stringing together of words. It's my understanding that the author has a poetry background and it definitely shows in the way the words flow off the page and even the paragraph structure. If sparse, bare-bones style is your preference, then Rivers' writing probably won't be your bag. However, if you're a genre fiction lover who sometimes wishes there was a bit more stylistic experimentation in genre fiction (I can't be the only one), Live is pretty damn appealing. More than usual, I found myself lingering over passages of this novel, rather entranced by the way Rivers' writing reflected the rhythm of Des and Heflin's relationship. I appreciated the subtle shifts in sentence cadence and phrasing as the points-of-view shifted--it's a quiet, but effective way of conveying character. The little bits of Welsh phrasing also added a richness that makes the writing stand out. My one reservation with Live is one that most people won't blink an eye at: Like in The Story Guy by the same author, there's a significant subplot related to a medical crisis of a family member. I recognize that this is a real situation many of us face, it's one that I tend to be more sensitive to than most. It's handled delicately, but I'm not sure the story needed it--Des had plenty of guilt and internal conflict about daring contemplating leaving her family and community as is. Again, this is a me thing and your mileage may, and probably will, vary. Live is going to go on my list of books I recommend to people who fear reading romance. This especially goes for readers who like "women's fiction" with strong romance subplots. It's definitely an internal, character-driven story and while the novel is, obviously, about a central romance, there's a lot of richness in terms of family, friendship and community, as well as a grownupness (not a real word, FYI) to the narrative, that will satisfy the romance-shy. Note: Live is, unfortunately, only available in ebook form (but it's only $2.99). Disclosure: Review copy provided by the publisher, Random House.